The joy of children is seen coloring the stroytelling activity at Pulo Besar Child-Friendly Integrated Public Space (RPTRA), Jalan Danau Elok VI, RT 13/11, Sunter Jaya Urban Village, Tanjung Priok, North Jakarta.
" This is so exciting"
Even the storyteller, Mardiansyah was no less attractive. He brought the story while wearing crown king accessories. Children are increasingly interested after they are invited to interact according to the story line. "This is so exciting," expressed, a student of Aljabar Kindergarten, Akila. This five-year-old child who lives in RT 05/RW11 Sunter Jaya hopes that it could be a routine activity at RPTRA, which is located near her home. 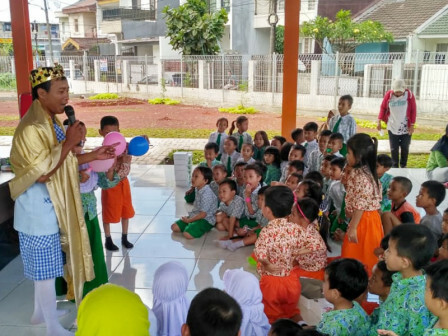 Mardiansyah, a storyteller of Nusantara Children Network social institution explained that the story has a message to motivate children to read books. "By reading, they can know science. I hope they are very enthusiastic to hear it," he told. North Jakarta Library and Archive Sub-agency's Library Section Head, Iwan Hery Susanto described that similar activity is also held in Malaka Asri RPTRA, Kita Bersaudara RPTRA, and Anoa RTPRA. It is open at 8 AM with two hours duration. "It aims to stimulate children to love reading books," he uttered.